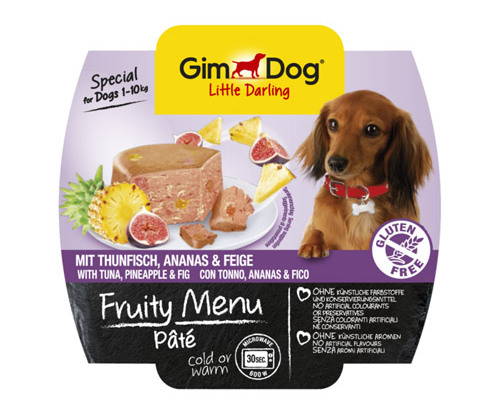 Fruity Menu Pâté with Tuna and pineapple & fig – A pâté made from fine Tuna and pineapple & fig pieces. As stimulating as a walk on the beach in the sea breeze. The new little Fruity Menus are ready to eat either at room temperature, or they can be lovingly warmed up really quickly by simply removing the packaging’s lid and placing the menu tray in the microwave for 30 seconds. meat and animal derivatives (50%, chicken 50%), fruit (pineapples 4%, figs 4%, from dried fruit), fish and fish derivatives (tuna 4%), vegetables, cereals (rice 2%).